The other day a discussion on Twitter got me thinking about how I think of my cameras — about how I classify them and why each one is around. A lot of us film guys have tons of cameras. 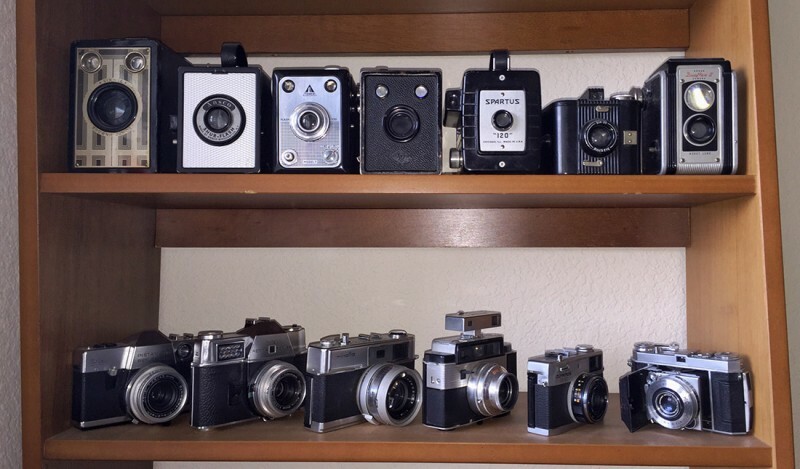 Are we collectors or photographers? It’s possible we’re really both. I know I am. It all started when Ribnar tweeted a link to my article on how I estimate camera values, and Jef Price pointed out that it was a good guide for a photographer, but that collectors might spend considerably more for a camera without as much concern for its functionality. Before long, we were discussing the sizes of our collections, which led to questions about how big a collection ought to be and why. How many cameras do you need? How many is too many? Is there an absolute minimum? Do you have different cameras for different types of work? You almost certainly have a variety of lenses for different situations, at the very least. 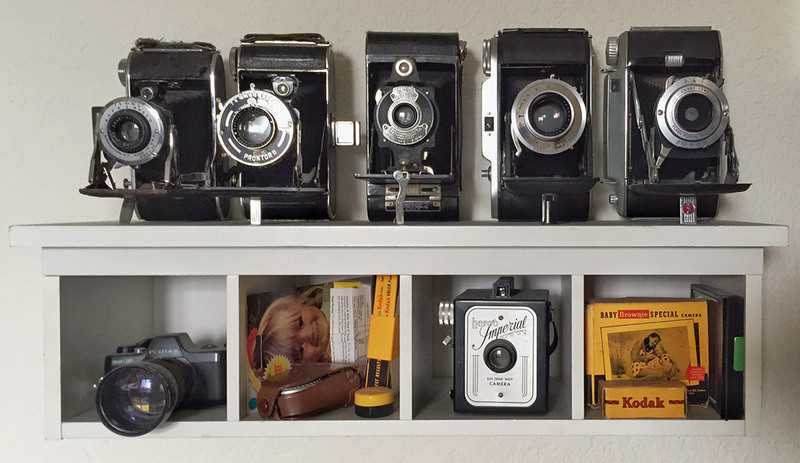 How many different kits or cameras do you have and why? How attached to them are you? Having more than one makes a certain amount of sense, and some of the reasons seem fairly obvious. Medium format excels at producing big, sharp negatives for fashion or portraiture, and can be plenty acceptable for landscapes and travel work. Large format is the undisputed king of the landscape realm, and can be great for highly-detailed work like product photography or other studio situations. 35mm is easier to carry around, and hard to beat for vacations, street work and photojournalism. This isn’t to say you can’t use large format for street photos (Louis Mendes, anyone?) or photojournalism (David Burnett, ladies and gentlemen), or that great portraits can’t be made with a 35mm camera (ask Henri Cartier-Bresson and his Leica). The camera is still a tool, and not everyone’s best tool for the job is going to be the same (if it were, there’d be no Nikon vs. Canon debate — neither would ever have gotten off the ground). It seems equally obvious, though, that too much gear can be a problem. Especially if you’re trying to move between it too often. Most serious working photographers have a limited number of purpose-driven cameras. Many even get so dedicated to a single system they become inextricably intertwined — Cartier-Bresson had his Leica, Robert Capa carried Contax, Arthur “Weegee” Fellig always had a Graflex Speed Graphic, and Richard Avedon and Irving Penn both swore by Rolleiflex. Some of us aren’t so quick to make up our minds, though. Dev Samaddar wisely points out the real problem with switching systems too often, though — after Ribnar points out the real reason we’re all addicted to cameras! I can vouch for this — since one of my pastimes is fiddling with cameras from thrift stores, I’m always using different stuff. It can be jarring, and sometimes a particular camera’s unique operation or ergonomics can definitely impact my ability to make the pictures I want to make. Plenty of my test photos really don’t meet my expectations. How often is it just because I’m not used to the camera? The disconnect happens often enough that it plays into the ratings I give cameras. Ease of use is always important, but so is ease of adoption. Results, of course, could trump all that. Box cameras are so easy to use they’re almost impossible to go wrong with — but I would never use one for anything I hoped to make a worthy print from unless I wanted that vintage look specifically. Beyond all that, some cameras are just plain cool. They’re beautiful, or historic, or some other kind of collector’s item — maybe personally nostalgic or very rare. The more you’ve got like this, the more likely it is you’re a collector. These are cameras or systems that I acquired with the intention of making good photographs. My working cameras are past the point of experimentation and are in good working order. They mostly live in ready-to-go camera bags, or have a strap attached, and so on. Most do not have a place assigned on my display shelves. The accessories I have allow me to do the work for which I bought the system, and I have spare batteries (where applicable). 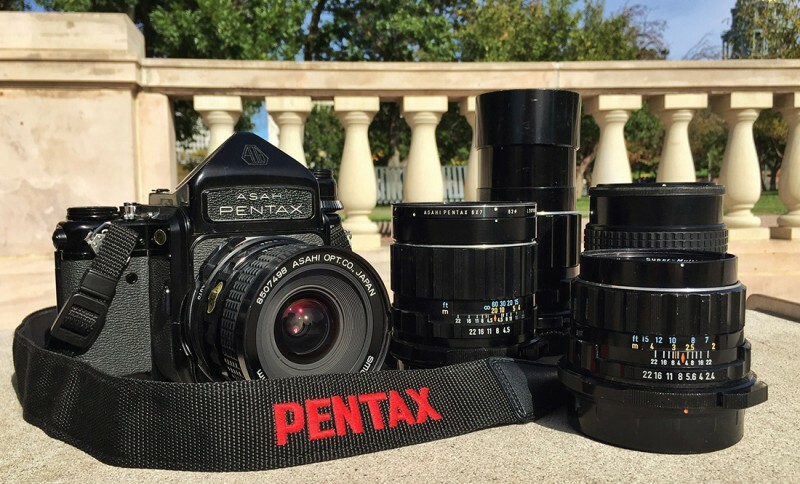 Pentax 6×7 system: Two bodies, six lenses, straps, a dozen filters, cable release, cold-weather battery adapter, a ready supply of fresh film, and a dedicated bag with spare batteries, tripod plates and notebooks. Nikon system: Two FM2n bodies and an F3 body with Domke straps, four lenses, half a dozen filters, lens hoods, two Vivitar 283 flashguns, and a dedicated bag with spare batteries, notebooks and three fully-loaded Hama Film-Safe X lead-lined 35mm containers. Large format: 4×5 Graflex Pacemaker Crown Graphic, two lenses, film holders, cable release, tripod, focusing hood, loupe, light meter, dedicated hard case and other accessories. Yashica-Mat: My favorite 6×6 camera, and my favorite TLR, all in one. Has no accessories and requires no batteries. I prefer not to use a strap with a waist-level finders. I carry it in my small Domke F5x-b bag when I take it out. I adopted this term from museums. 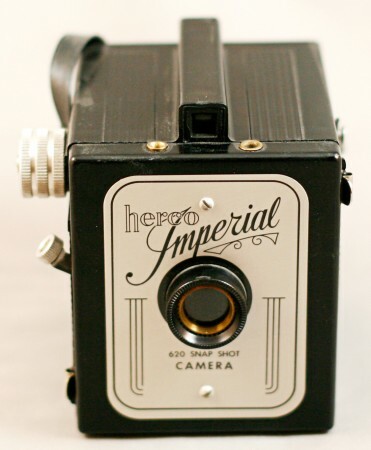 To me it represents cameras that have historic or personal significance, and which I don’t intend to sell or give away. Further evidence that I am part collector, and I have the shelves of display cameras to back it up. Not all have been tested or reviewed, but many have been. I still use some of these from time to time, as well, but usually more for fun, or for work that isn’t as important. Kodak Brownie Junior Six-16: Personal significance is the real key here — I found it at an antique shop on vacation and I like the memory. 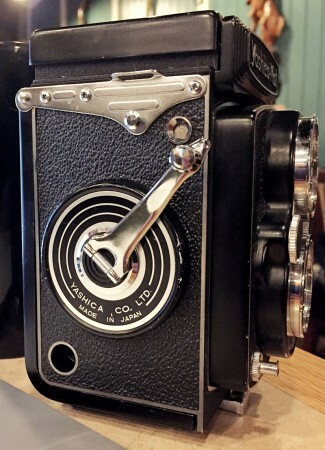 It’s also an attractive camera, and the only 616 format camera I have. Leica IIIc: A gift from my parents, and my only Leica. Don’t know that much about it yet, but I know it won’t be going away. Nikon F2: A thing of beauty, and my go-to camera for post-apocalyptic scenarios. The fact that it can share my other Nikon glass is a big bonus. It’s also great to have around for size comparisons. 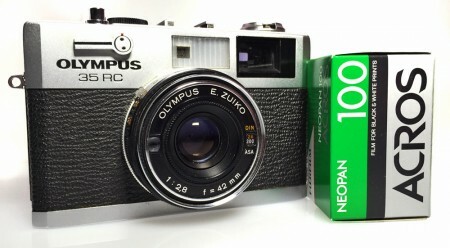 Olympus Trip 35: A design home-run that’s tough to beat for simplicity. Superb lens, too. Despite being a very recent addition to the collection, I foresee it being on the shelf a long time. This is pretty much all the rest. I’ve referred to my collection before as a Home for Wayward Cameras, in part because some of the cameras were added only so I could find them a good home where they would be used and appreciated. Some are duplicates and some are broken, partially or completely. Most of these cameras were added to the collection because they were cheap or unique, or even just new to me. Many of them will eventually be tested and reviewed. Some have been already. Some may never be. They key thread here is that these cameras hold little or no special significance to me and, once they’ve been reviewed, are up for grabs. That could mean for sale, or even just to give away. Some examples include my three Olympus XA2s, several Kodak Retina folding cameras and Instamatics, some other box cameras, and a plethora of miscellaneous pro- and consumer-grade 35mm SLRs. At some point in the future I do intend to post a list of the cameras I’m done with and offer them for sale, but I just haven’t quite gotten there yet. How many do I actually need? Maybe three or four. How many do I want to keep? A couple dozen. How many do I have?